In my post Archaeology on my own PC, I discussed what I did with some files from the early 90s, that I found archived on my PC, and how I got them into a modern file format. Some of the files were in .drw format. These were produced by a long-vanished DOS-based drawing package, Lotus Freelance Graphics. I read online here that Lotus SmartSuite 9.8.2 Millennium – itself long vanished – should be able to open them, and save the results to PowerPoint. Copies of SmartSuite are available on eBay, so I ordered one, and it arrived yesterday. I popped the CD into my PC, and ran the installer. I marked every part of it, other than Lotus Freelance Graphics, as “do not install”. Freelance installed fine on Windows 7 (64-bit), and started fine. I installed Freelance only from SmartSuite 9.8 on a Window 7 PC, no problem. Open the DRW file in a blank page, use ‘save as’ to convert. You will probably wish to avoid this by setting a user preference: File | User Setup | Freelance Properties | Skip the startup dialogs and bring up a blank page with no look. Note also that the “blank page” will be in landscape, whereas you probably want portrait (since that was the Freelance for DOS default). This is File | Page Setup | Portrait. I have yet to discover how to change this by default; or how to fiddle with the page size either. Once you have a blank page open in Freelance, then when you do File | Open you get a long list of file types. There are two .drw imports – use the Freelance one at the bottom! Here using keyboard shortcuts will speed things up quite a bit – e.g. Tab, Down arrow, End, Up arrow, to choose files! 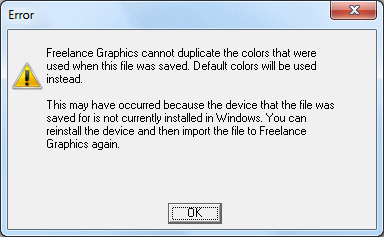 “Freelance Graphics cannot duplicate the colors that were used when this file was saved….” Which is impenetrable. And … “the device that the file was saved for”? But then, in the days of DOS, when printer drivers were the responsibility of the application, not the operating system, you got extreme coupling like this. What device is involved I don’t know, of course. Probably some long forgotten screen or printer. Anyway if you OK that, you get your diagram imported. Mine all seem to be black and white, but I hazily remember that this was the case back then. It was a marvel, in 1988, to be able to draw at all on a PC! So … this strategy does work. For most of the files, anyway. A few simply were blank. This may be fixable, tho. In one case, it was blank if I imported into a landscape page, but when I saved it anyway to PPT, a load of text was scrunched up at the top of the page. So I tried again, imported it to a portrait page, and it worked fine. One problem that I encountered was where bitmap files had been imported. Even when these were in the same directory, Freelance refused to find them. I’m unclear how to fix this. I wouldn’t try to do new work with Lotus Freelance Graphics, tho. After a while, “f32main.exe” started to crash when I saved as .ppt. Why this happened I don’t know, but no doubt has something to do with being a very old piece of software. We can do rescue stuff only. About to reboot. Hope that fixes it! UPDATE: It didn’t. But I found that if I saved a few files as .jpg instead, then turned back to .ppt, it worked. Weird.